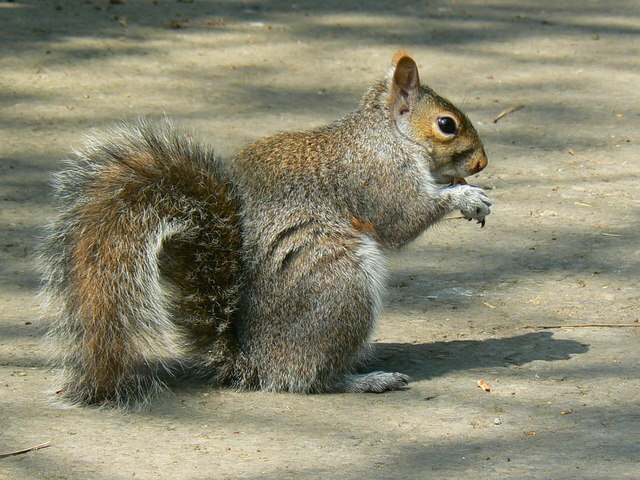 The Grey Squirrel was introduced from the USA into approximately 30 sites across the UK from 1876-1930. Grey squirrels can cause serious damage through their gnawing of cables, building structures and other vulnerable materials such as insulation & wiring as they search for food or nesting material. They will readily inhabit lofts, attics and roof spaces as well as outbuildings. Signs of their presence will be scratching noises and droppings; however, these can be mistaken for rat droppings. They are not thought to carry human diseases but can bite if they are frightened. In addition, grey squirrels may pass fleas to domestic animals which can be treated using animal flea treatments. They will also cause damage to woodland, allotments and other garden and outdoor areas. Grey Squirrels can carry Parapox virus, which is fatal to Red Squirrels. The Red Squirrels are now classed as endangered. Grey squirrels can survive in copses, shrubs, hedgerows and trees, and build their nests from twigs, leaves and moss. They have a varied diet of seeds, buds, flowers, shoots, nuts, berries and fruit from many trees and shrubs, and will also eat fungi and insects. There are two breeding seasons each year (one in Feb / March and the other in June / July), with 3-7 kittens in each litter. Kittens are born with their eyes closed, without teeth and with no hair. After about seven weeks they look just like small versions of their parents and are ready to leave the drey. At Town and Country Pest control we can identify and eradicate a Squirrel problem quickly with minimum fuss. If Squirrels are infesting your roof space, they can be denied access by sealing up access routes using chicken wire. However, you must ensure that there are no young or adult squirrels in your loft space before carrying out proofing work. Entrances to loft spaces can often be inaccessible, so you may have to contact us at Town & Country Pest Control to carry out the work for you. They will also be able to advise when to carry out pest control so as to avoid the breeding season. Control is conducted by trapping, shooting or proofing of the routes the squirrel is taking.